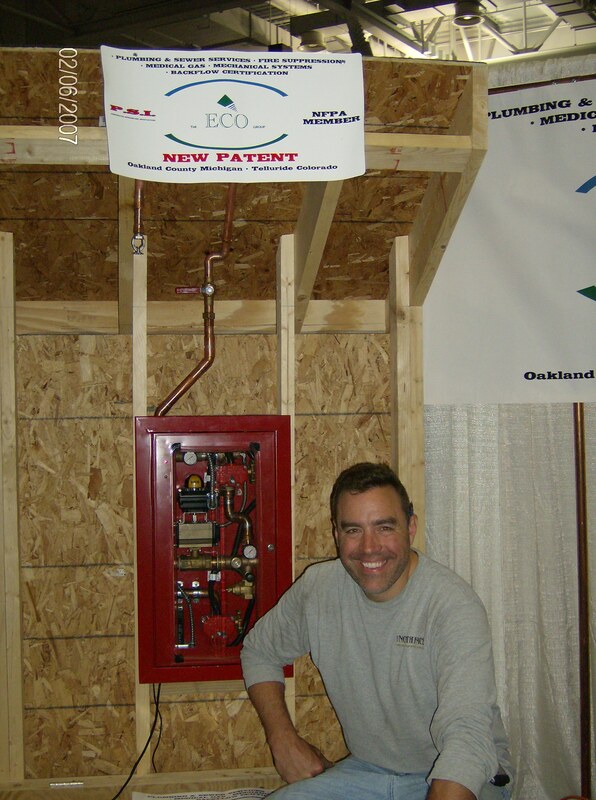 The ECO Group, Inc. got its roots with over 50 years of Plumbing and Mechanical, hands on trade experience. This experience was then merged with a comprehensive understanding, and acknowledgement of the environmental, humanistic, and physical needs of the everchanging world in which we must integrate and maintain. The ECO Group, Inc. is committed to provide "Old School" integrity, with "New Age" ingenuity. With the recent development and U.L. listing of non-differential assemblies, The ECO Group will offer residential/ commercial/ industrial/ and institutional zone/fixed zone dry pipe valves and Apportioners which are compact enough to fit into a stud wall, and portable enough to be designed in line. Unit's have been displayed in the NFPA World Life Safety Conference and Exhibitions in Boston, Mass., Las Vegas, and Chicago. 1" Dry Pipe Valve WSCE Boston, MA, patent pend. Robert A. Long founded The ECO Group, Inc. in June of 2003. Robert is a third generation Master Plumber/ Master Contractor. Licensed in UPC, IPC, and BOCA, in Michigan and Colorado. With 25 years of experience, Robert is committed to the industry as well as to the end user. In his most recent accomplishment, he received U.L. listing for the Dry Pipe Valve (shown here) and unveiled at the World Life Safety Conference and Exposition in Boston, Mass. in June of 2007. The Product received "Standing Room Only" crowds as it was fired off during the show. The dry valve is compact and affordable. It is intended to be used for residential applications for entire homes, or in zones. It is intended to be used in industry or commercially "In Line" to serve as an extension of a wet system, or in zone's. This product is sure to be an asset not only in superior life safety technology, but will allow the industry greater design options for fire suppression systems.